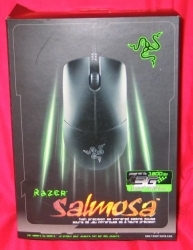 When I hear the words “gaming mouse”, two thoughts come to mind. “Ooh, that’s interesting,” is followed swiftly by “wonder how much they’re gonna pillage my wallet for this.” Gaming mice have traditionally been expensive: companies like Razer, Logitech and even Microsoft have been engaging in a perpetual arms race to see who can cram more features into their latest offering. Sometimes, though, you don’t want 15 different sensitivity settings, and 42 buttons with 7 macros a piece bound to them. Sometimes, you just want a good, solid mouse with a great sensor, responsive buttons, and as little set-up fuss as possible. 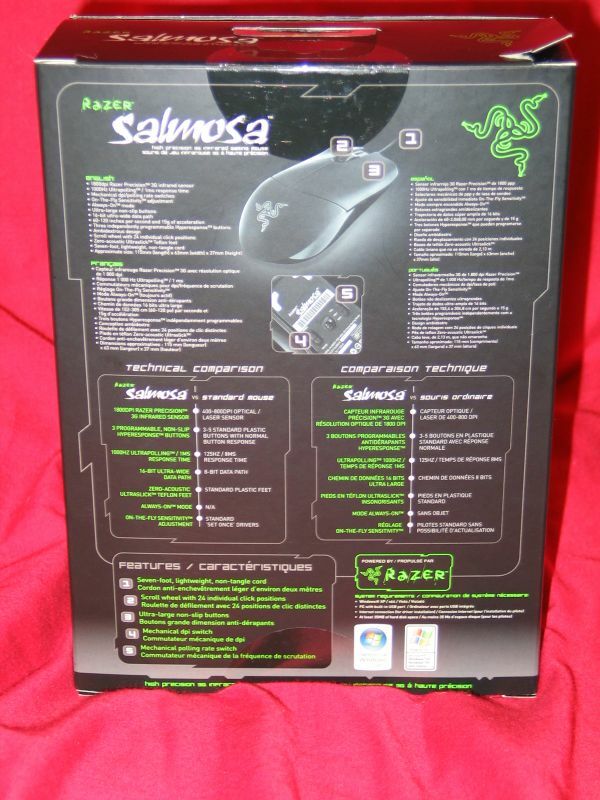 Razer has worked to answer that need, and the result of their efforts is the Salmosa, which I’ll be looking at today. 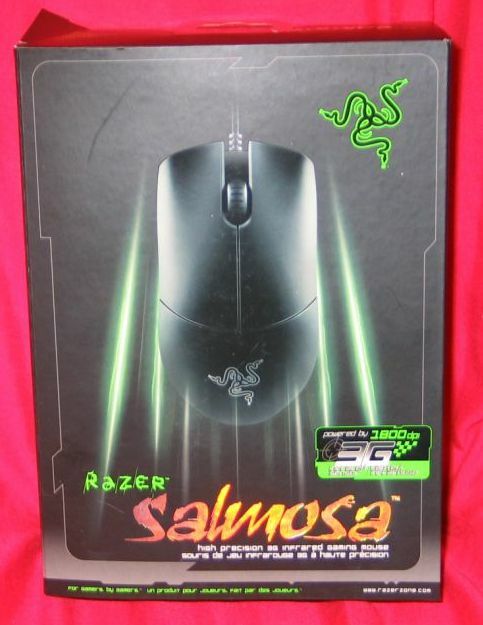 The Razer Salmosa is the quickest entry level gaming-grade mouse armed with the fastest tracking optical sensor in the world. Designed to be one of the lightest and most compact mice of its class, it is the ideal mouse of choice for finger-tip grip gamers who seek both speed and control. The Salmosa is clearly trying to pack a lot into a small package. Utilizing the same 3G sensor as the DeathAdder, it eschews its bigger cousin’s lights and extra buttons, instead delivering the essentials in the smallest practical package. The Salmosa is designed for the fingertip grip style, which I’ll go into later. For now let’s take a closer look, and see if this is a mouse you can sink your teeth into, or one that just bites. 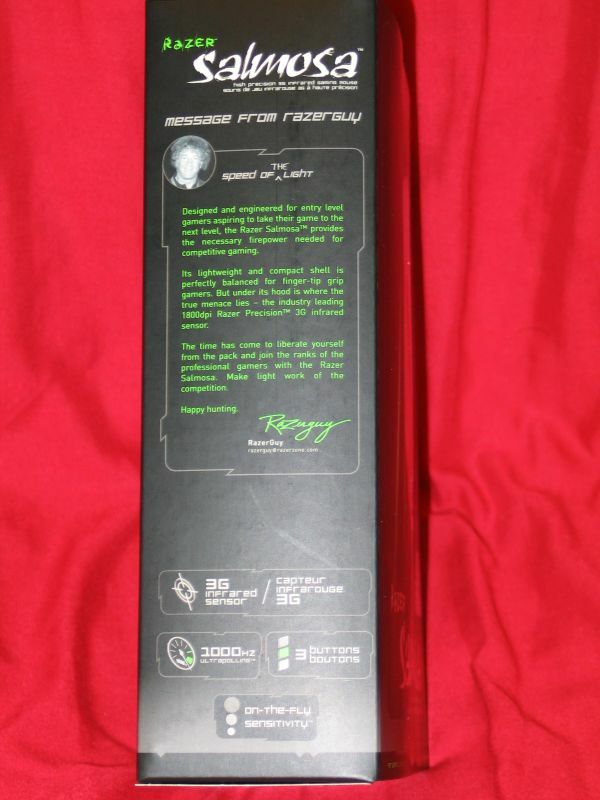 As usual, Razer has packaged the Salmosa in a way that is straightforward, and appealing to gamers. 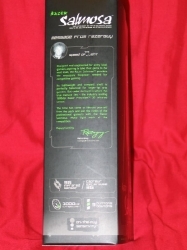 The front features the mouse itself front and center, with the Razer logo and product name also prominent. 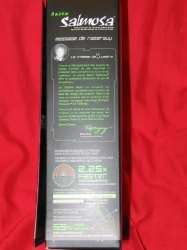 The back features a breakdown of product features, along with a few detail shots. 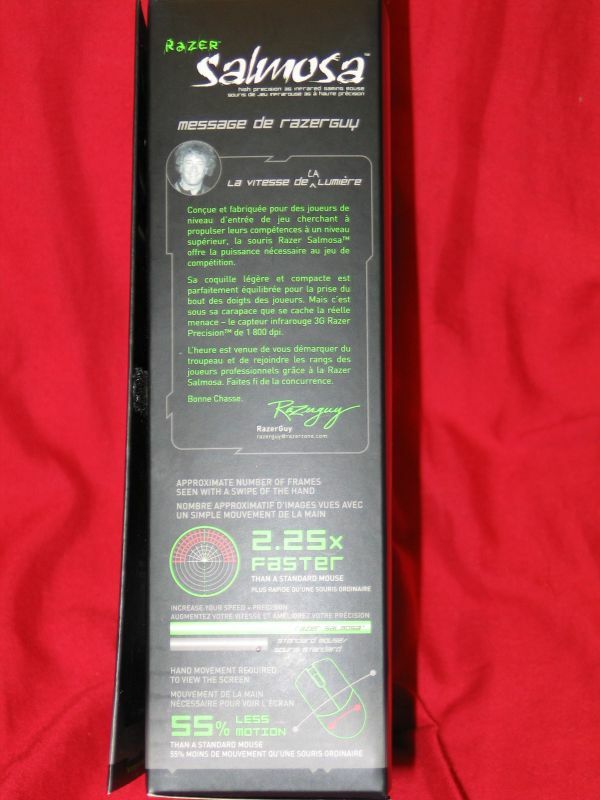 The left and right sides feature a message from “RazerGuy” in english and french. 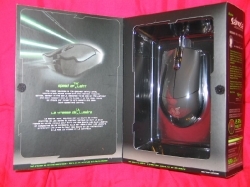 Opening the front flap, we see the mouse itself encased in a plastic sarcophagus, so you can get a quick approximation of the feel without ripping the box open.